Is Amazon Cheap on 200 Times Earnings? Ever since Amazon (AMZN) came to prominence as an online book store in the 1990s, it’s been redefining how we shop. The e-commerce company has distrupted the retail sector; causing the demise of not just book stores, but clothing, electronics, sports equipment and even food retailers. As it takes its first foray into the healthcare market there’s a more unorthodox area it’s also disrupting: how investors value companies. The mainstream way to value a company tends to be by looking at its price/earnings (P/E) ratio, which compares a company’s share price with its earnings per share figure. One can extend this out and look at the price/earnings-to-growth (PEG) ratio, which frames the P/E in the context of a company’s expected future growth rate. On the traditional P/E metric, Amazon looks prohibitively expensive, trading on over 200 times its 2017 earnings. But fund managers still believe the company is “cheap”. The stock is, of course, a serial winner. It’s share price is up by a quarter in 2018 alone. Since the end of 2016, it’s almost doubled in value. And since one of its biggest backers, the Morningstar Gold Rated Scottish Mortgage Investment Trust (SMT), bought it back in 2005, it’s gained over 2,800%. And still, Tom Slater, co-manager of Scottish Mortgage, believes the share price has “absolutely failed to keep up with the huge underlying operating progress” it’s made over the years. "What Amazon’s Done is Incredible"
Since its humble beginnings, Amazon has branched out into many different industries. Its newest areas of interest are groceries, television production and now healthcare. That’s ignoring the potential of Amazon Web Services (AWS), its market-leading cloud computing platform. Just last week, it beat analyst expectations with net income more than doubling at $1.86 billion in the fourth quarter, on revenues of $60 billion. Slater points out that Amazon’s sales growth of over 40% this year compares to around 6% per year for the market as a whole in the past three years. Lewis Grant, co-manager of the Hermes Global Equity Fund, says that if the firm can continue that rate of growth as expected then it will “double revenues every two and a bit years”. Further, adds Walter Price, manager of the Allianz Technology Trust (ATT), AWS could be a “multi-hundred-billion-dollar business”. He reckons the stock will go even higher once people realise this. Grant says it’s “ludicrous” to try to justify Amazon’s P/E multiple as being attractive. “When you get to that type of number you know you’re in nonsense land,” he adds. “That’s because it’s not the way to value a business like this. Slater agrees, going as far as to say that “looking at short-term price/earnings multiples can be quite dangerous”. Grant explains that the profits Amazon currently makes are irrelevant because it re-invests every penny back into the business. Instead, the “almost unheard of growth rates” it’s delivering currently make it “good value” as an investment. When Scottish Mortgage first bought in, the stock promptly fell in value by about a third, says Slater. In the 11 months after Christmas 2007, it halved in value. “So, there’s been long periods where we’ve looked quite stupid owning the shares,” he continues. 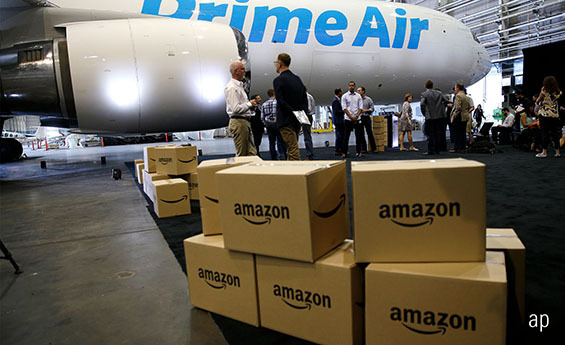 Both Price and Simon Edelsten, manager of the Morningstar Bronze Rated Mid Wynd International (MWY), say their way of valuing Amazon is based around its cash flow. However, they reach different conclusions. Price says the former number does not make Amazon look that expensive. It’s 41 times ATT’s estimates, “so relative to the growth rate and the potential I think it’s inexpensive”. Edelsten, though, picks up on the free cash flow decrease. He says that worries him in the context of a half a trillion dollar company. “You’ve really got to see cash earnings after tax quite obviously giving a margin of safety” if the stock is going to dominate your portfolio. Mid Wynd bought Amazon for around $400 in April 2015, but finished selling out just over two years later, with the last tranche fetching $1,000 per share – a decent profit. While he’s since seen the stock re-rate 45%, he’s comfortable with the decision and notes that the Japanese robot component makers he bought with the proceeds have outperformed even Amazon. Will Netflix Take Down ITV?